Gluten-free foods have come a long way in the last few years! From creating your own recipes to finding favorites on local store shelves, eating gluten-free and healthy has never been easier! One brand in particular, Van's Foods has a great variety of gluten-free foods! My family has been Van's Foods fans for quite some time now and I couldn't wait for my children to give their newest cereals a try! Van's Foods has launched two new delicious cereal flavors to their award-winning cereal line: Blissfully Berry and Cocoa Sensation. These simple yet wholesome cereals feature 17 grams of whole grains and 5 grams of fiber. The best part - you won't find any artificial flavors, high fructose corn syrup, egg dairy or corn in these cereals. Did you know that all Van's cereal varieties carry the Whole Grains Stamp from The Whole Grains Council and they are certified by the Gluten-Free Certification Organization?! So go ahead and grab a spoon and pour yourself another bowl of deliciousness! Whether your enjoying these new tasty cereals for breakfast or as a quick after school snack, they will be sure to be a big hit in your household! The Cocoa Sensation is crunchy, and full of chocolate goodness- this was hands down my son's favorite! My daughter chose the Blissfully Berry, she loves strawberries and this cereal hits the spot for her! So what do you think? Which flavor are you most excited to try? Connect: Be sure to follow Van's Foods on Facebook and Twitter! Buy it: You can purchase Blissfully Berry and Cocoa Sensation at your local grocery store! 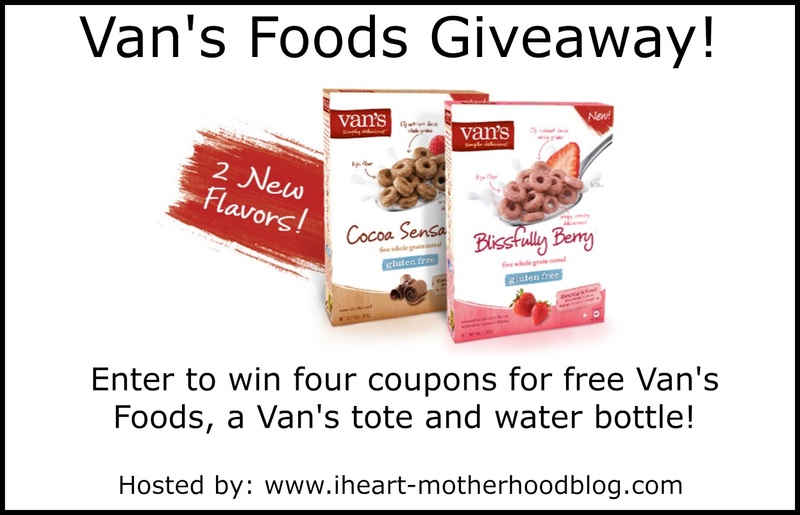 Win it: One lucky reader will win four coupons for free Van's Foods, a Van's tote and water bottle! I'm excited to try Bissfully Berry! I would really like to try the Cocoa Sensation flavor. I would love to try the Bissfully Berry! I'm most excited to try the Blissfully Berry :).